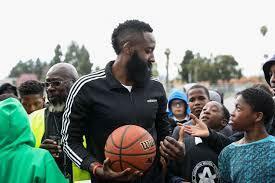 Adidas and James Harden present the Imma be a Star Block Party on Sunday, June 24th from 3:00 pm to 6:00 pm. Come ready to play ball with Adidas Trainers. RSVP at hardenblockparty.com Attendees must present flyer or Eventbrite confirmation for block party at entry per person, plus two guests. NO BAGS OR OPEN CONTAINERS ALLOWED-NO EXCEPTIONS! All participating minors must complete a release waiver, which you can download.